Is Xi Jinping willing to bring his anti-corruption drive to bear on the People’s Liberation Army? For all the recent fervor in the United States over China’s military modernization programs, corruption within the ranks could be weakening these efforts behind the scenes. According to Xinhua, China’s official defense budget for 2013 was $114.3 billion, a 10.7 percent increase over 2012. Western analysts such as Andrew S. Erickson and Adam P. Liff have noted that it is incredibly difficult to tell exactly what this money is being used for. “China still does not release even basic information that would provide insight into intra-PLA spending priorities, including a budget breakdown by service, the total amount spent on weapons imports, or the procurement costs of specific weapons and platforms,” they told the National Bureau of Asian Research in 2013. It’s worth wondering, though, if the Chinese government itself keeps a careful eye on where all this money goes. Given the amounts of money Chinese civilian officials have been convicted of embezzling—over $28 million in the case of former Railways Minister Liu Zhijun—if there are similar levels of corruption in the PLA, a significant chunk of China’s defense budget (both reported and unreported) might be used not to develop new weapons systems, but to pad officers’ pockets. There haven’t been nearly as many public reports on corruption in the PLA, but the occasional investigation does suggest the scale of the problem. In 2005, the last military official to be toppled by corruption charges, Adm. Wang Shouye, was rumored to have stolen almost $20 million. In April 2012, PLA General Liu Yuan, the political commissar of the PLA’s General Logistics Department (and rumored to be a close friend of Xi Jinping’s) gave a series of candid speeches on the issue of corruption in the PLA. According to Foreign Policy, Liu told PLA officers that “no country can defeat China … only our own corruption can destroy us and cause our armed forces to be defeated without fighting.” In addition to misusing funds, Liu also pointed to the problem of effectively buying promotions, another issue that the civilian and military spheres seem to share. This could have serious repercussions on the efficacy of Chinese military leadership. Also in 2012, the New York Times profiled a book by Chinese Colonel Liu Mingfu, in which the officer claimed that “the People’s Liberation Army has reached a stage in which its biggest danger and No. 1 foe is corruption.” The two outspoken critiques of corruption in China’s military were taken at the time as a sign that Xi Jinping, who (unlike Hu Jintao) has close military ties, might be getting ready to clean house. In fact, Xi’s anti-corruption drive has been a higher priority than many would have guessed, and it has reached the PLA as well. For example, new laws have restricted the number (and brand) of cars military departments can own. The Asahi Shimbun reported earlier this month that Xi Jinping was making additional efforts to ensure that anti-corruption policies are implemented by military as well as civilian officials. However, in contrast to the almost monthly reports of high-ranking Party officials being busted, there have been far fewer reports of military officers being investigated and arrested. Gu has been one of the notable exceptions—and to date, there haven’t even been any official announcements about the investigation. Gu’s name has merely been scrubbed from official websites. An unnamed “anti-graft expert” told the Global Times that “there is grave corruption in the military,” especially in the logistics sector where Gu worked. 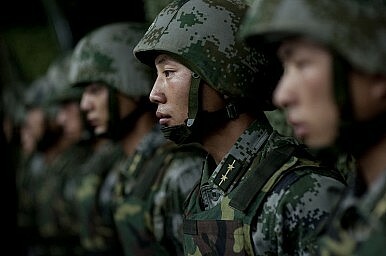 But, the expert added, the fight against graft in the military is kept under wraps to preserve the PLA’s public image. This is a huge contrast to the public push to eliminate corruption in civilian circles, where the government takes pride in naming the latest “tigers and flies” ensnared in its probes. Recent reports about Gu’s opulent lifestyle are drawing more attention to the issue of military corruption. Still, it’s notable that the recent reports detailing Gu’s ill-gotten gains did not feature in China’s official state media, although the semi-official Global Times did run the story. Instead, reports on Gu appeared in the Hong Kong-based South China Morning Post and in a mainland paper, Caixin, famous for its independent reporting. This may indicate that, while the government is willing to let such stories be published, the Party is not yet willing to make a concerted media push against military corruption. It’s a trend to watch closely as Xi seeks to tighten his control over the Chinese military through the newly formed national security committee.